New hunters out for revenge? At least Jesse and Cesar were more about teaming up than fighting against Sam and Dean. Oh, and there was a sexually-charged cicada spirit the four hunters had to try and take down. But was it that scary of a monster of the week? 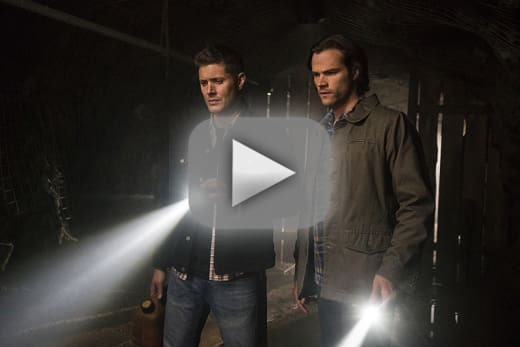 TV Fanatic staff writers Sean McKenna and Christine Laskodi and The Winchester Family Business’ Alice and Nightsky team up to talk Supernatural Season 11 Episode 19. And they answer if Sam and Dean get to have a happy ending on the show. Join in the latest Supernatural Round Table to talk “The Chitters”! Alice: Honestly, it was super hard for me to pay attention during this one; it was so slow. I don’t remember too much about it. I did like the salt and burn of Jesse’s brother and seeing the satisfied look of closure on Jesse’s face. That was something that has never happened on this show before, ever. Usually that moment of revenge happens and it’s totally empty. Christine: I loved that reaction shot for Dean when he realized that Jesse and Cesar were husband hunters. It seemed to serve as a nod to the slash-fic community who loves to ship Sam and Dean together (though, why? ), and it was also just a nice aspect of storytelling for the show. I thought that entire scene was really funny and memorable. Nightsky: Um… I don’t have one? Nothing spectacular stands out for me from this episode. There were no witty lines or emotional scenes worth remembering. The only high note was that Jesse and Cesar could retire from hunting and be happy. They chose family. Isn’t that what it’s all about? Sean: I really liked when Dean and Cesar were investigating the lair. It was great to pair these two together, and I liked the dark atmosphere as they tried to find the creatures. It just had that horror vibe that I like from Supernatural. Was the cicada spirit a scary monster of the week? Christine: No. I was so confused by it being sexually charged, but then they kept showing the victims jittering alone in the woods. It was creative and different, for sure, but scary? Nope. Don't they remember that they have bad luck with bugs? Nightsky: No. The lore about them didn’t make sense. A bug that has to use the anatomy of another species to mate? Darwin’s laws would have killed these guys off a long time ago. The presentation of them also alternated between repulsive and ridiculous. They were trying very hard to be scary or shocking but didn’t make it. I don’t call this one a win. Sean: I didn’t think they were scary, but I actually liked this monster of the week. There was a certain creep factor with that cicada sound. Really, I just liked that it was something different than just rehashing a monster we’ve seen before. What did you think of Cesar and Jesse? Alice: I liked them, and they were the best part about this episode. I don’t think we’ve run into level headed, down-to-earth hunters before. The fact that they weren’t mistrusting dicks and willing to work with Sam and Dean was refreshing. Christine: I'm really enjoying the way that the writers have been expanding the hunter universe this season, and Jesse and Cesar definitely are another great addition. 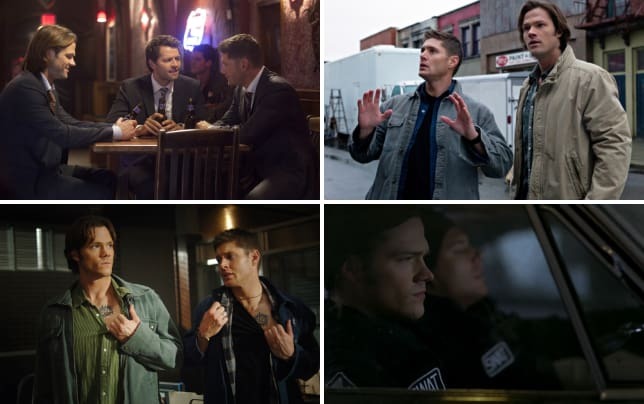 I also really liked how many parallels they had to Sam and Dean's own hunting career, which led to some great moments of reflection for the brothers. Nightsky: I thought Cesar was excellent. Good character and well acted. I was not as fond of Jesse. It may have been the way he was written or it may have been his portrayal, but the sudden jumps between being mean, angry, desperate and sad were abrupt and unconvincing. I did, however, like the concept of a person (Cesar) helping his partner find justice and peace even though it wasn’t his fight. Sean: I agree that getting these new hunters was great for the episode, and they weren’t out to try and betray Sam and Dean later on. Plus, having a married couple as hunters was a nice change of pace rather than just two brothers. I’m glad they got a chance to retire even though I was hoping we’d see them again. Should Dean have asked Cesar and Jesse for help? Alice: No. They were happy. As I said earlier, this happens on this show like, never. Christine: Absolutely not. The whole message to take away for the Winchesters was that there is a finish line, and eventually, they'll find their own. If Dean had asked, it would have totally ruined the impact of that. Though, I do think they need to ask SOMEONE for help. They're full of dead ends as far as beating Amara. 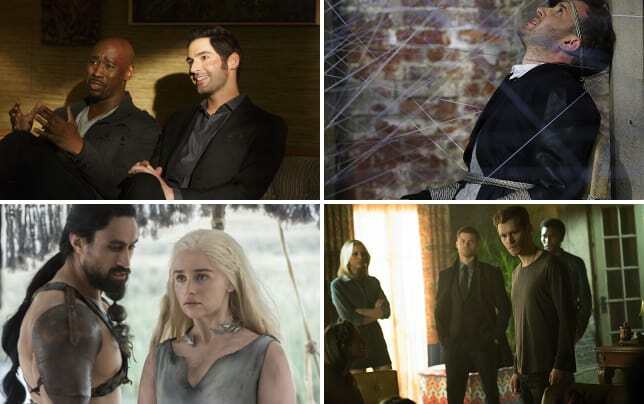 It's time to call in some reinforcements who aren't living happily ever after. Nightsky: No. It would have meant certain-death for Cesar and Jesse. You can’t take hunters who only battle “normal” monsters and throw them into a battle between gods, angels and demons. Hunters exorcise or kill demons, but bargain with the King of Hell and the Prince of Darkness to defeat a deity released from an ancient Mark of Cain curse transferred from the Father of Murder? Way over their heads. Plot wise, continuing them in the story would have only served to have them be canon fodder for a cheap emotional death. Letting them ride off into the sunset was the right call for both Sam and Dean and the writers. Sean: Like I said before, as much as I wanted to see them come back and help Sam and Dean, it was good that they got to have a happy ending. That really does happen pretty much never. It also means that there might be a chance for Sam and Dean to get their own finish line and have that happy ending. 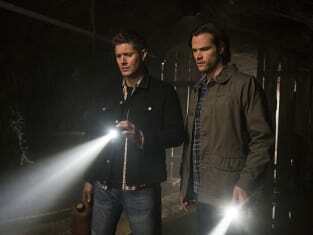 Will Sam and Dean ever retire from hunting like Cesar and Jesse or will they be hunting to the bitter end? Alice: I’ve always had this fan thought that one of them would retire happy. I picture Sam being a mild-mannered Men of Letters, having a wife and kids, while Dean leads a reclusive life like Rufus but still stays close to Sam. But then I realized that they’re both way too damaged and will never allow themselves to be happy. They’ve seen too much crap. So, to answer the question, I wish they would, but we already know the answer. There ain’t no happy ending. Christine: I really like Alice's answer, which I totally agree with. I WANT them to retire happy. I really do. They've sacrificed so much to save the world SO many times. But then again, it's true. They are so messed up from everything they've done that I don't think they could ever retire happily and settle down. They've both tried it before and failed miserably. They're going to be just like Bobby and Rufus, hunting until the very end. Nightsky: They won’t retire, but I do believe they’ll survive. I have an entire scenario worked out in my mind where they train the next generation of Men and Women of Letters/hunters. Sean: I think it would be great for them if they could retire, but I think they will be hunting until the bitter end. That’s just the world they’ve gotten into and invested in. They may both survive by the time the series ends, but I can see them still gearing up for another hunt. That’s what they do. Saving people. Hunting things. The family business.